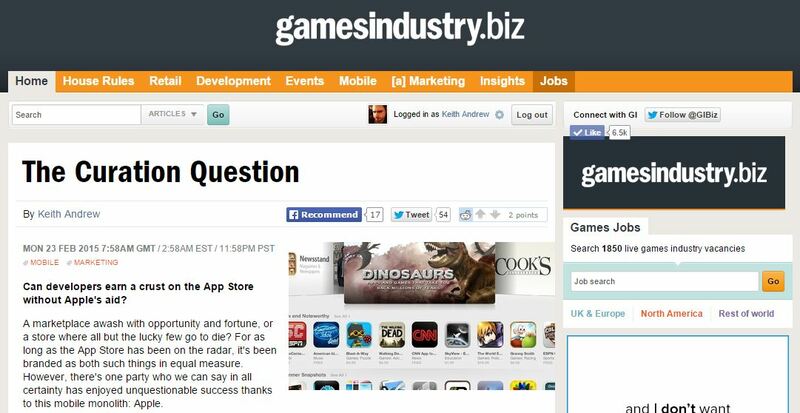 Article: The Curation Question – Can developers earn a crust on the App Store without Apple’s aid? A marketplace awash with opportunity and fortune, or a store where all but the lucky few go to die? For as long as the App Store has been on the radar, it’s been branded as both such things in equal measure. However, there’s one party who we can say in all certainty has enjoyed unquestionable success thanks to this mobile monolith: Apple. The firm has just enjoyed the most profitable quarter by any public company in history and, as this article stretches across the screen of my laptop, has also just seen its market value surpass $700 billion – another world first. Have-a-go historians will pin the company’s recent earth-shattering success on the launch of the iPhone in 2007, but there’s weight to the suggestion that it was the roll out of the App Store a year later that really fired Apple’s engines. For the leagues of developers who populate that App Store, its continued success is as much of a curse as it is a blessing. It remains the default marketplace for almost all mobile developers, having pioneered the model that Google, Microsoft and BlackBerry were only too happy to cherry-pick from when launching their own respective marketplaces. The success of the App Store – and ‘success’ seems like an especially tame way of describing it – draws in developers like moths toward flame, but it’s no exaggeration to note that it burns more studios than it lights up. That’s because, with more than a million apps on the store (almost a third of which are games) the majority struggle to find an audience, lost in the noise as the marketplace’s big boys capture all the downloads. The argument is that those who do find life on the App Store lucrative have one thing in common: they’ve been featured by Apple.